Our younger guests are of great importance for us and we’ve received a German ministry award for our family oriented offering. There is a children’s playing room on the premises and during vacations Baiersbronn runs a daily children's program. A cosmetic or massage treatment can be arranged for you. Each room at the Goldener Hahn has been lovingly furnished and decorated by Kathrin Gruber to provide guests with the comfortable feeling of home. Our regular visitors come back again. You can treat yourself to a cosmetic program, relax in our pool and sauna or get a massage (at the main building, close to the Goldener Hahn Residence). Please let Kathrin Gruber know three weeks before arrival! Our younger guests are of great importance to us and we've received a German ministry award for our family oriented offering. There is a children's playing room on the premises and during the vacations Baiersbronn offers a daily children's program. Paradise for gourmets and for hikers: Baiersbronn is a paradise for gourmets: there is a total of six Michelin stars united in Baiersbronn, and one of the restaurants in Baiersbronn (“Traube”) is one of the Top Ten restaurants worldwide (according to the International Herald Tribune). The landscape here is the setting for one of the most beautiful vacation spots in the heart of Europe. In Baiersbronn a multitude of opportunities for a varied holiday experience are available to active vacationers, as well as those in need of rest and relaxation - in close proximity to home. Each year during the most beautiful season in the Black Forest, namely from the end of July to the end of September, approximately 20 different hikes are organised, which are subdivided into four topical themes (family hiking week, the most beautiful trails in Baiersbronn, the waters of the Black Forest and rock formations). Please contact Kathrin Gruber for further details. She will also provide you with a hiking map. Your Hosts at the Goldener Hahn guesthouse in Baiersbronn: Kathrin Gruber: a mother of two in her 40's, is your hostess at the 'Golden Rooster'. After studying business management and interior design, she attended the hotel management school 'Belvoir' in Zürich (Switzerland). Andreas Gruber-Beck: is Kathrin's husband and is available for questions. Andreas is also responsible for the internet and the technique, so any questions you have, he is the person to ask. Stefan Gruber: Stefan Gruber is Kathrin's brother. While he is not available during the week, he is available on weekends. He is a skilled piano player and will sometimes play for the guests, using the beautiful piano located in the room across the hall from the playroom. Eric and Anna Gruber: Eric and Anna are Kathrin and Andreas' children. They are available to play and to show your children the best toys in the playroom! I've stayed in the Drossel apartment (1 bed/1 bath) with my fiance for the past 3 months. It's been a very comfortable, quiet, and clean place to stay. It's had everything we needed. Kathrin, the owner of the Goldener Hahn, is an excellent host, and has been very quick to respond to anything I need throughout our stay. She's always kind and friendly, and speaks excellent English. I recommended that my family stay in another apartment in the Goldener Hahn when they came to visit us, and they enjoyed their stay here as well. It's a good location in Baiersbronn -- walking distance to the train (less than 10 mins), food market, and lots of good restaurants. I'd certainly come back if I were coming to the Black Forest again. A WONDERFUL trip to the Black Forest! My husband, John, and I decided to visit somewhere new last Summer(2007) and the Black Forest seemed like the place as it's greenery is not so different from our scenery in Scotland! The directions from AA Route Planner were very precise and the journey from Zebrugge(we crossed from Rosyth to Zebrugge on Superfast ferries) to Baiersbronn was breath-taking as we passed through many beautiful villages. We arrived later than we had thought but Kathrin was there to greet us and had been worried that we had been in an accident- that first impression of a very caring hostess will remain in my memory!! We had the smallest apartment at the top of the house but it was fine for two and very clean- we did meet people in the Golden Rooster who were there with their children and they invited us to see their bigger apartments which had fabulous panoramic views of the Black Forest area from their balconies! We had a little balcony which we used regularly to have our meals when the weather was good. Overall we had lovely sunshine for most of the two week stay with a couple of wet days in between-the rain cleared the air which was good! We hadn't planned to do a lot a walking but there was plenty of information available from Kathrin as to where to visit, beauty spots,etc. We enjoyed going for drives around a 60km radius most days returning to the Golden Rooster for a refreshing swim in the indoor pool each evening before heading out for a meal. During our stay you would receive information on a daily basis of organised outings from the hotel to places which Kathrin's Dad was involved in as he would drive the minibus for those guests who wished not to use their own transport. On one occasion we visited a very fancy hotel a few miles away which boasted an award-winning Michelin Chef but the cost reflected this-way above our budget, but nice to see how the other half live?? What I will advise is that in this area people eat earlier than expected and most restaurants finish serving before 9pm-so be prepared!! My husband brought his guitar with him and ended up playing and singing in the bar of the local hotel-name of which I can't remember!- the locals enjoyed it so much ,he was invited back to play before we returned home! What I really loved was the mini-lakes that just seemed to appear as you walked through the forests- the tranquility was so refreshing and did us alot of good as we live very busy lives at home in Glasgow! The Golden Rooster- a holiday to remember! We flew to Basle from Liverpool courtesy of Easyjet, hired a car and drove up to Baiersbronn in around 2 hours. Beautiful scenery en-route. The Golden Rooster is in a great spot with fabulous views over the hills and only a stone's throw from Freudenstadt which is a lovely German town with a huge town square with a number of water features and fountains - also great shopping. Tourists can travel free on the local trains which allows you to leave the car behind and go out and explore a very wide area of the Black Forest. The trains are clean, fast and always on time (envy and jealousy here!). The people are really friendly with a good sense of humour and do their best to make you feel welcome. The food is generally very good, especially pork dishes, however English menus are not always available, so it wouldn’t do any harm to take a small dictionary with you (assuming you don’t speak any German!). The accommodation at the Golden Rooster is spacious and spotlessly clean. 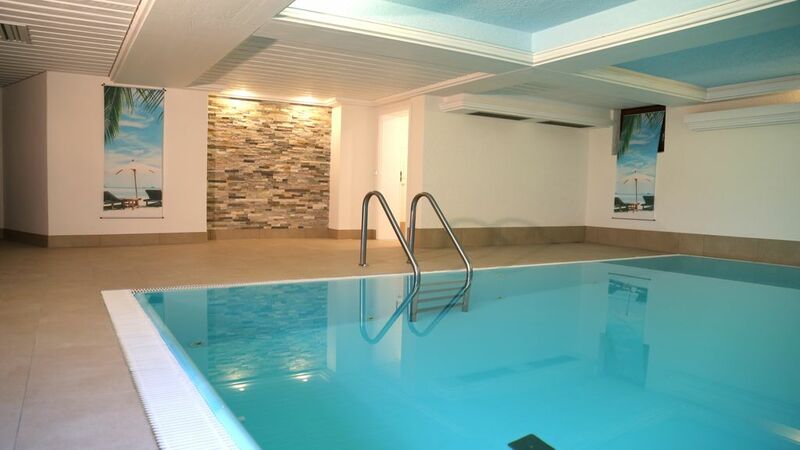 The indoor pool and quiet room are great places to relax of an evening as you watch the sun go down. Kathrin is a lovely hostess who speaks perfect English and is very knowledgeable about the local area. She really makes you feel welcome, and after two visits in consecutive years we will definitely be going again. Baiersbronn itself is a really pretty town and has a fantastic outdoor swimming pool – three pools actually, adults, young kids and toddlers. The kid’s pool has a brilliant water slide and we spent most of our time in that one (even though we didn’t have any kids with us!). There’s also a small café at the pool that sells snacks, hot food, cold and hot drinks, beer and wine! Also you can jump, dive, splash, play with inflatable toys and generally enjoy yourself as their rules cover safety – not enjoyment! You can spend the whole day here, but watch out for sunburn because it can get very hot! There are some great walks to be found in the forest where you come across large wooden chalets serving meals and drinks. There are also secluded lakes, which you can swim in. We took picnics on a couple of occasions and spent the day sunbathing and swimming in one of these lakes at Sankenbachsee – absolutely fantastic! I can’t praise this accommodation and the Black Forest area enough. Go and try it for yourself! Baiersbronn is a Climatic Health Resort on an altitude: 534 - 790m, with a population of 6340 inhabitants. The Black Forest has one of the most fascinating landscapes in Europe. And within this magnificent region lies Baiersbronn, the state of Baden-Württembergs biggest (in terms of surface) community. So what awaits you? The nicest mountains of the northern Black Forest, Europe's biggest hiking network, Germany´s most creative cooks. Health Climate Resorts and family-friendly restaurants. Baiersbronn is a paradise for gourmets: there are a total of six Michelin stars united in Baiersbronn, and the restaurants in Baiersbronn (“Traube”) is one of the Top Ten restaurants worldwide (according to the International Herald Tribune). Golf: There is s practice green and a driving range in Freudenstadt. As a guest at the Golden Rooster, you will be given a reduction on the green fee at the 18 hole golf course in Freudenstadt (7 km). 8 golf courses (all within an hour's drive) will keep the boredom at bay. Ski: Let's build a snowman today! Some people think winter is the best and most relaxing time for a holiday. Small wonder, when everything is glistening and sparkling in the sun: the trees, the meadows and the houses all look beautiful. Take off on 'shank's pony' along the cross country skiing tracks or down the pistes.